Southern Tier Update. Yes, Boston, Massachusetts. No, we don’t have a man with us. All good news on the Southern Tier. So far so awesome. 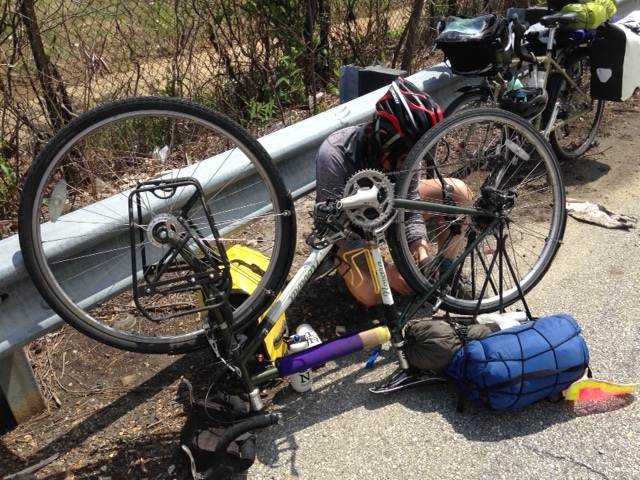 Olive and I have been facing some headwinds, uphills, epic descents, and mostly sunny days. We have succeeded in balancing our bikes together. This is no small feat, as many of you may know from personal experience. This is especially helpful when we get sick of touching our bicycles. Since we have been riding through mostly desert in Arizona, we spend about 9 hours in contact with the steel beasts. 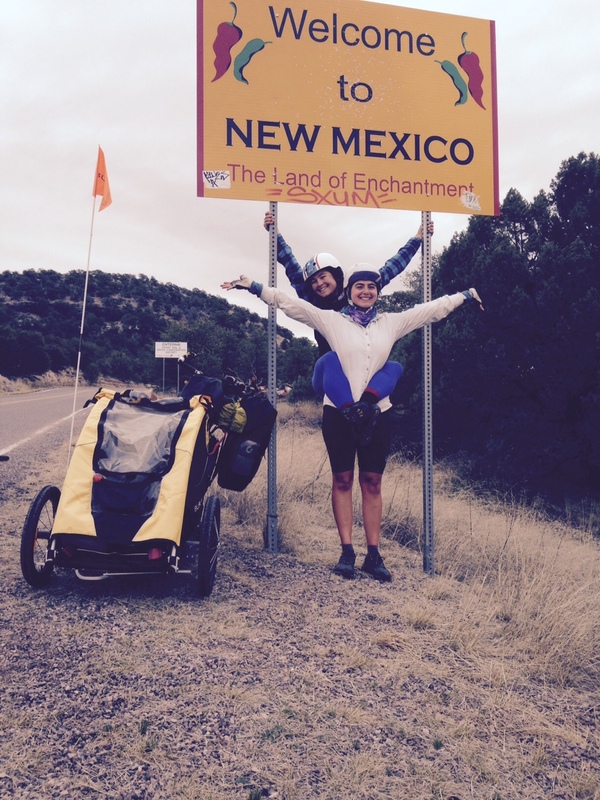 We ride 50-70 miles a day, and our biggest climb yet was over 5,000 ft in between Arizona and New Mexico. Biking over the San Diego coastal range, we met Rachel Throop, pro-mountain biker and part-time waitress. She adopted us for the night after we met her at a local brewery. Thanks to her, we’ve gotten a little more famous on Instagram, which is AWESOME. On our way out in the morning, she hooked us both up with Oakley sunglasses for the rest of our tour. Thanks, Rachel Throop! The bike life is full of adventurers. We met John and Su while staying with a very giving woman in the CA desert. 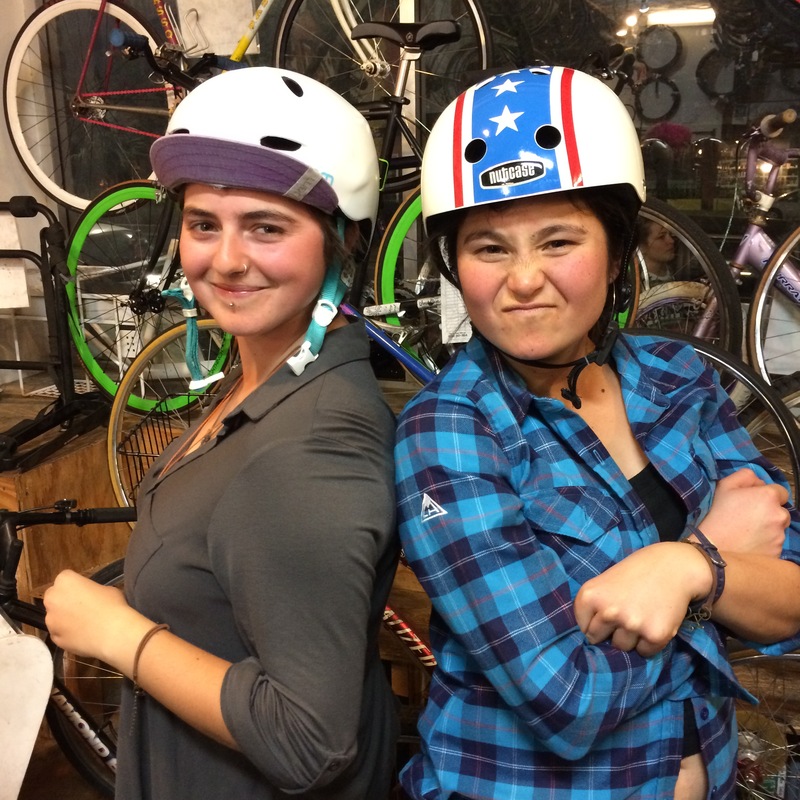 They are two very normal and level-headed people who quit their jobs and have spent the past year and a half trekking and cycling the world. It’s nice to see more women on the road. Girl power! 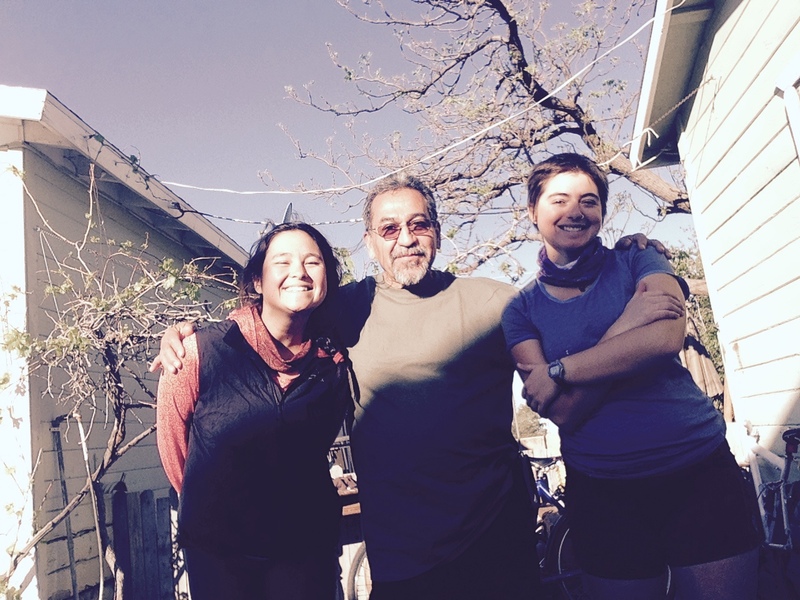 For those of you that think Olive and I are amazing and/or crazy for biking across the country, check out this family. Mom, Dad, and two kids. 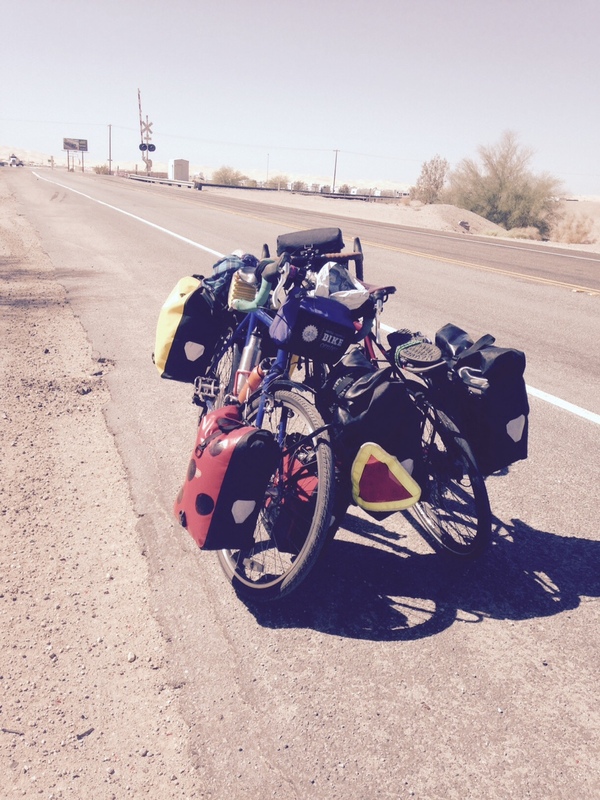 We met them in Carlsbad after they had already spent months biking Europe and South America. The youngest was in diapers when they started and quickly learned that sitting in poopy in a bike seat is no fun. Mama was interested in our menstrual cup wares; we are excited to see how it works out for her. 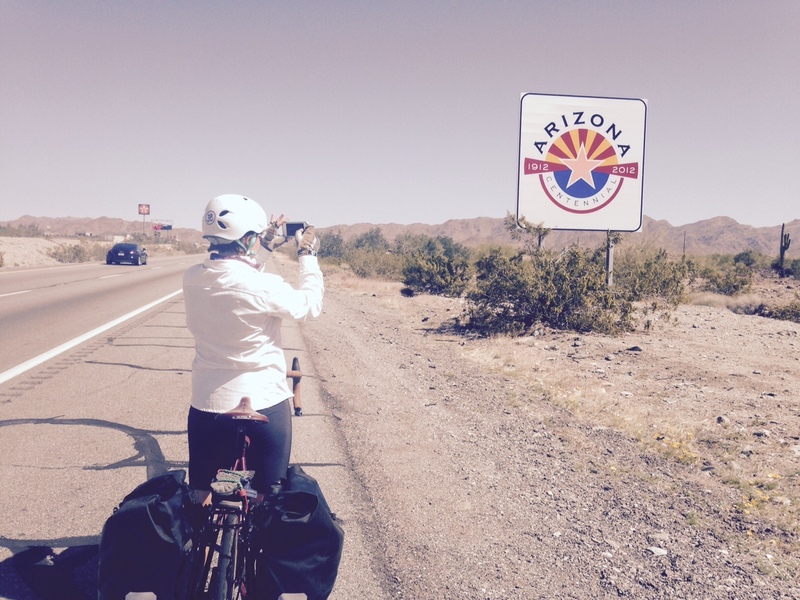 Crossing into Arizona meant starting dry desert days. We were met by many warmshowers hosts who are more than accommodating. 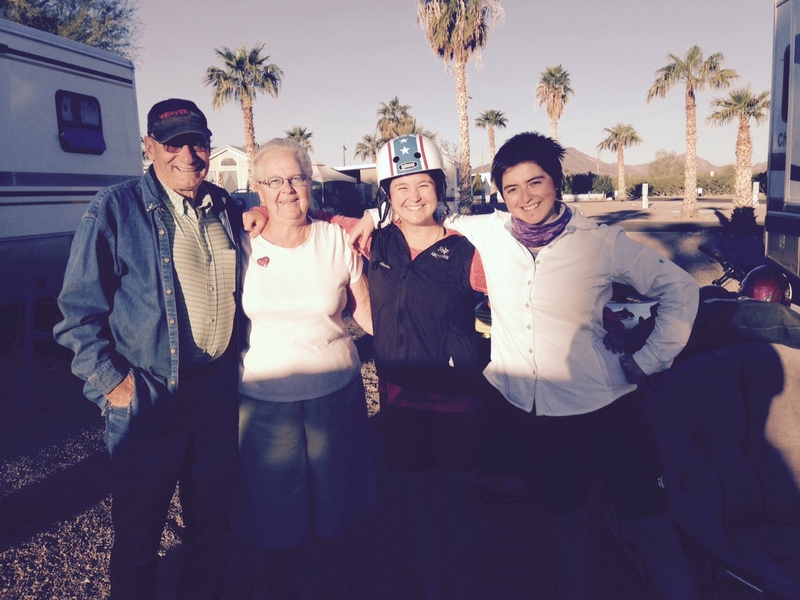 We also met Lauren and Karren, two snowbirds from Wisconsin who winter at the Desert Gold RV park in Brenda, AZ. We were standing in front of the only grocery in “town”, met Karren, and within 30 seconds had been offered to sleep on their RV plot. After dinner and discussion, we of course were upgraded to the living room floor and breakfast in the morning. We had a lot to talk about, as a young woman in Karren’s family almost died from TSS a couple of years ago. Another cup giftee, and we are looking forward to exploring the new option for this now tampon-free person. After our breakfast, Lauren accompanied us on his bike as we rolled out of town. If we can encourage anyone to get on their saddle a little bit more, the trip has been worthwhile. 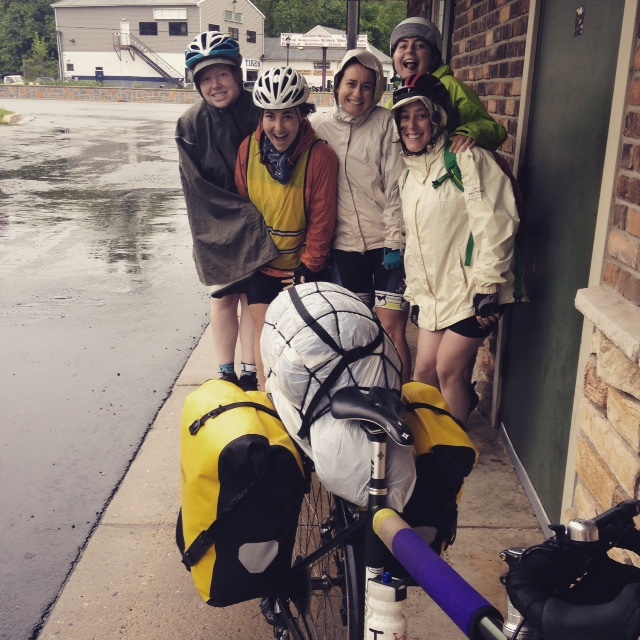 A few miles down the road, we were flagged down by a very fun group of young cyclists. 2 couples who met on the road plus us made 6 happy peas in a pod. 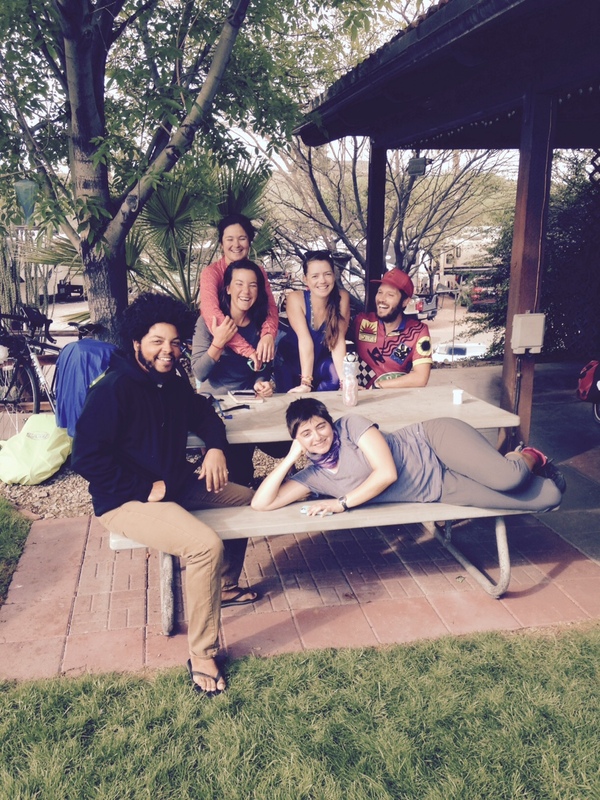 We biked to the next town together, camped with a communal dinner, and made fast friends. We look forward to seeing them again as we roll through Austin and NYC. Olive and I were solo again as we rolled into Superior, AZ. We had a big climb ahead of us, the wind was picking up, and it was getting to be dusk. We decided to go find a backyard to camp in. 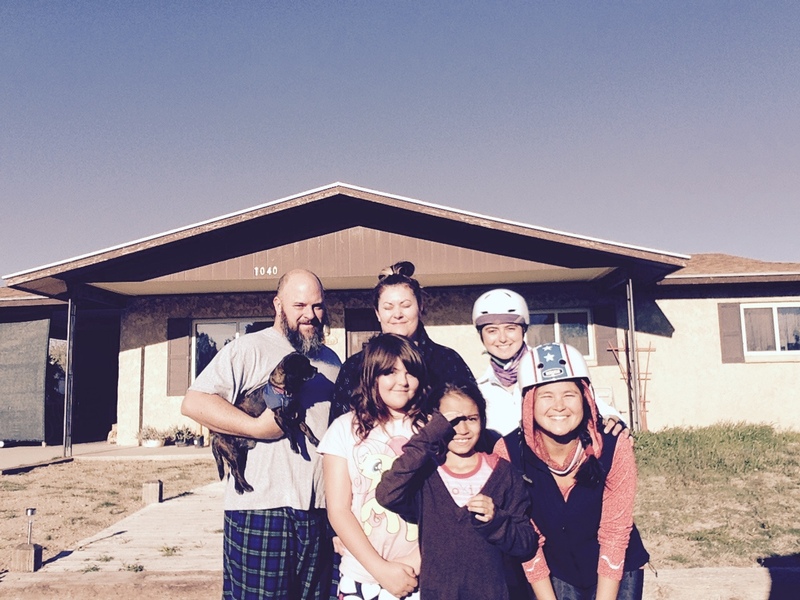 Lucky for us, we met life-long resident Dennis as he was hanging out with his grandkids near his home. Camping in his back yard turned into showers and then breakfast in the morning. We are still in touch. Eastward into Arizona, we stopped at a gas station in Thatcher for a water refill and started talking to Jared, an organic gardener, composter, vegetable juicer, and super awesome granola bar-baker. I know, you wouldn’t believe it by the photo, but I swear it’s true. We were his first cyclists to take in because he wanted to “show his kids that there are still good people in the world”. We shared dinner together, had a great time with his kids, and again slept on the living room floor. Olive got the couch cause she’s spoiled. Not to mention showers and laundry. AND amazing granola bars for the road. 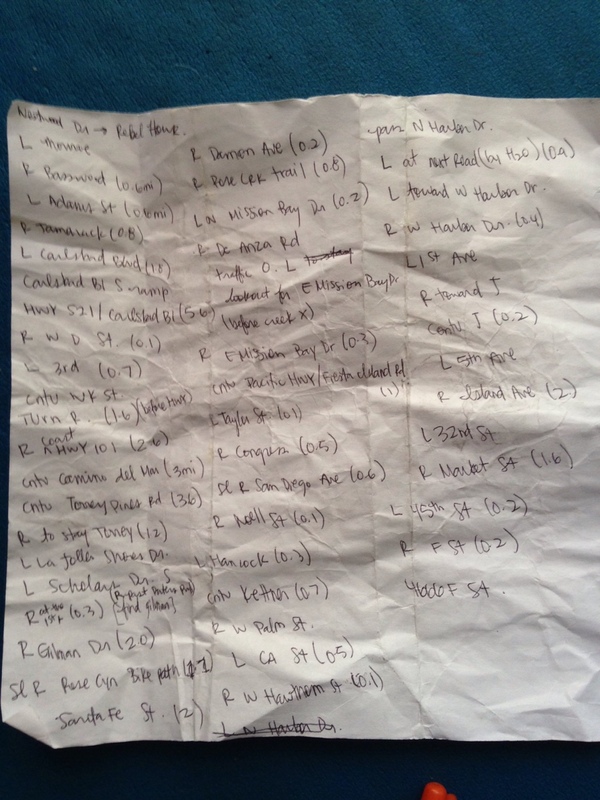 They kept us going over the next mountain summits. Thank you, Rios Family! We look so happy to be in New Mexico because we just biked over 5,000 ft to get here. The bike trailer next to us belongs to Josh, a Oregon man who’s toting Shoeless Joe Jackson, a beautiful dog who runs upwards of 40 miles alongside his pedaling dad. Now we are in Silver City. We have found a treasure here. 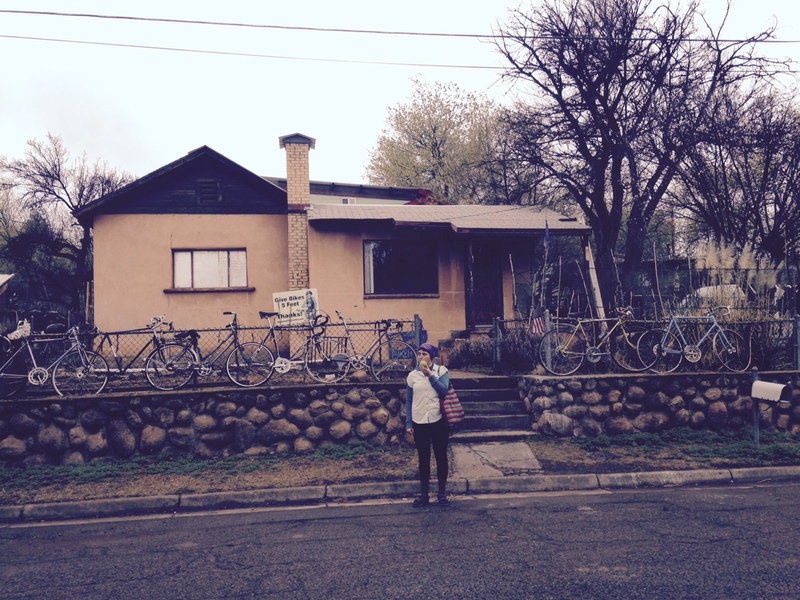 The Bike Haus. After rolling into town after 6 pm with no plans, we were directed to this bicycle safe-haven and immediately taken in. It’s a home with friends. How awesome is that? We had a nice rest day, and we are ready to summit Emory Pass tomorrow. 2,500 ft just over 8,000 in elevation. Along the way, we’ve had a couple of very worried mothers. “Just the two of you? Aren’t you scared? What do you do about danger?” Well, “Yes. No. We don’t get into it in the first place”. You don’t need a man to go on a bike tour. I encourage anyone with the inkling to do it and be smart about it. If you want some more inspiration, check out this awesome collection of solo female bike tourists traveling the world. 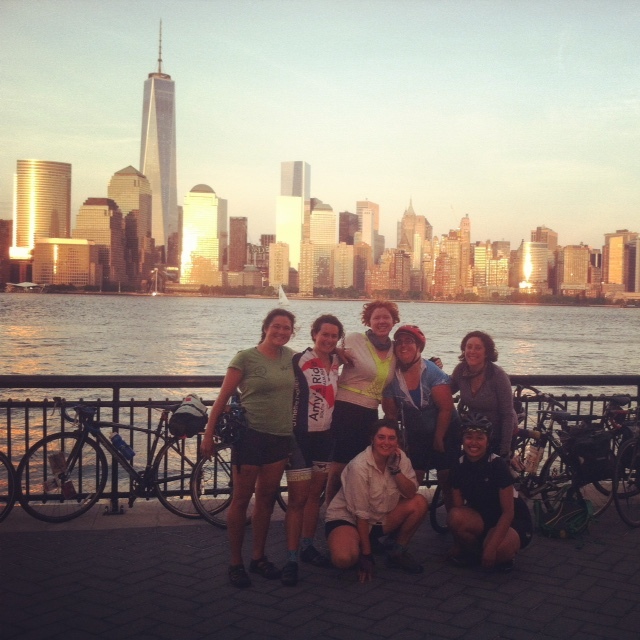 WOW–Women On Wheels. Directions. Can never have too many of ’em. Las Cruces, New Mexico. March 20. 7-8:30 pm Mountain View Co op. Greetings! 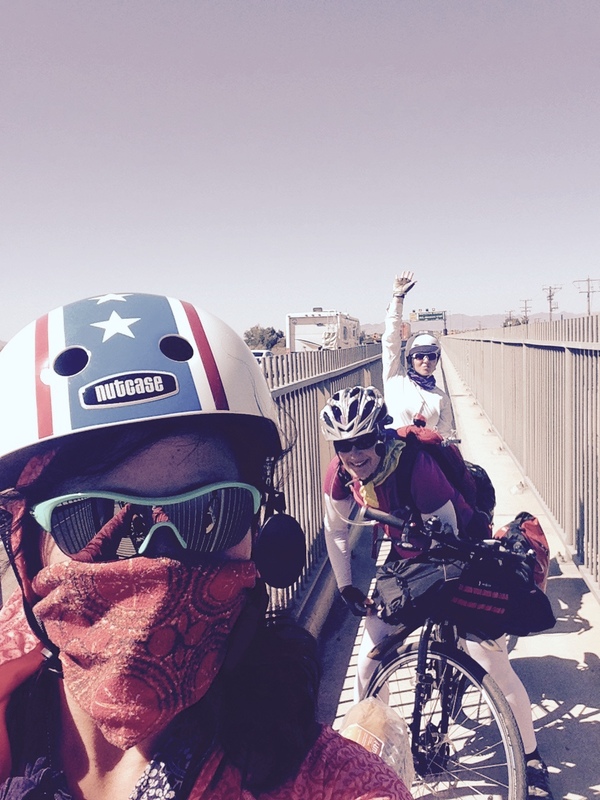 Rachel and Olive are in Long Beach after a beautiful and easy ride from Los Angeles. 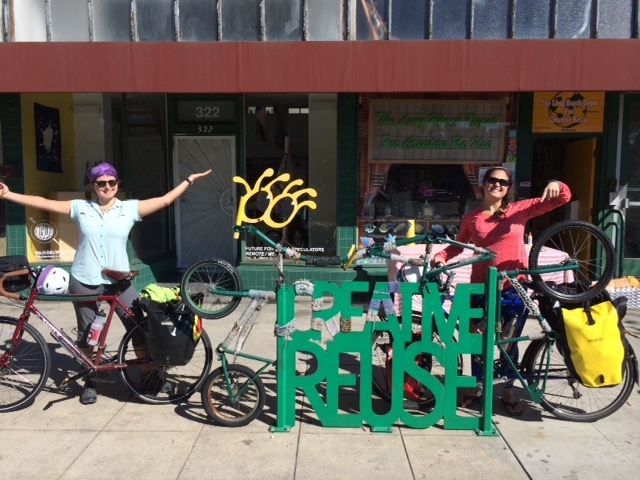 We had a great Sustainable Cycles Workshop at The Long Beach Depot for Creative Reuse. Who’s ready to bike cross country? We are! We had a lovely event at The Bikerowave in Los Angeles on Friday. 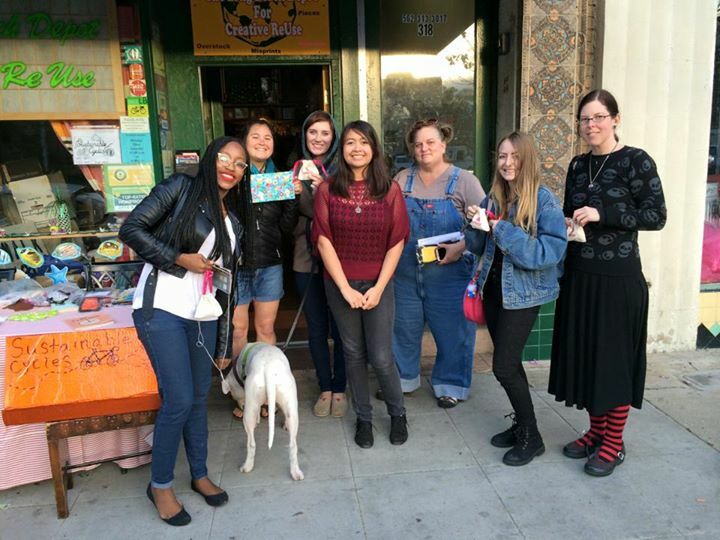 Goodbye hugs, potluck food, and lots of free menstrual cups. It was a grey start to the day, but not much rain. We are water-proof and ready for puddles. Thank you, @DeFeet for the warm gloves! The Long Beach Depot for Creative Reuse is a trash-to-treasure business. Lisa and Yoshino are an amazing mother and daughter team that run the store. Stop in for any type of art supply that every existed. 320 Elm Ave! 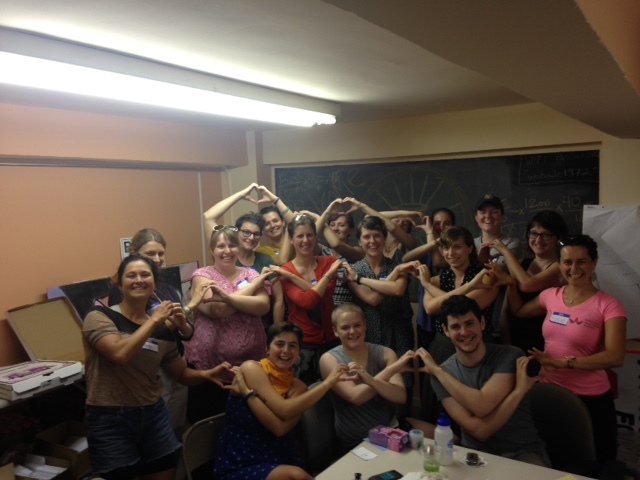 Thank you for a great workshop, ladies! See the woman in the overalls? That’s Frau Fiber. She’s awesome. 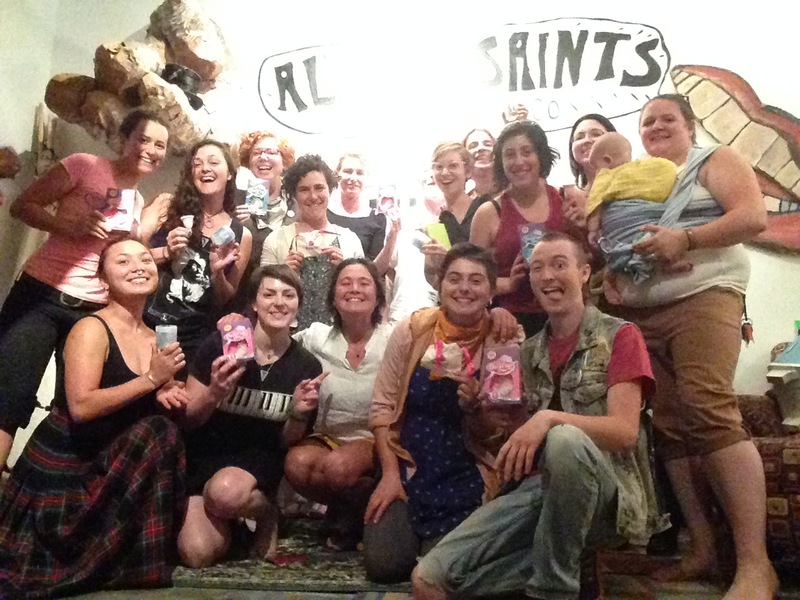 A super OG feminist activist seamstress craftswoman maker. Long Beach, you got it goin’ on!